The strongest floor marking tape we’ve ever created. Based on the profile of our top selling original SafetyTac® tape, SafetyTac® 2.0 takes durability to the highest level, being constructed from an ultra-rigid 70-mil heavy duty composite material that is rigid and both shatter and break resistant. Forklifts, trucks, carts and foot traffic don’t stand a chance against this extremely tough tape. SafetyTac® 2.0’s low profile allows it to sit smoothly on your floors, so it will not create a tripping hazard. 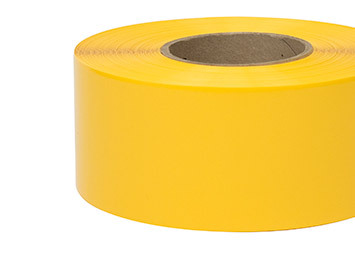 This tape’s flexible and resilient material prevents damage when heavy equipment turns or pivots on it. By using a denser, harder material, we’ve created a tape that is even more durable and can withstand intense traffic. SafetyTac® 2.0 can withstand the tough conditions of an industrial workplace. It will hold up to foot and vehicle traffic, wet conditions, and even chemical spills. Applying SafetyTac® 2.0 tape to the floor is simple. Remove the backing, lay the tape on the floor, and press it down. No dry time required.